We aren't far from the northern edge of Ipswich, but already the lanes are narrow and winding, the fields a hog's back of ridges. 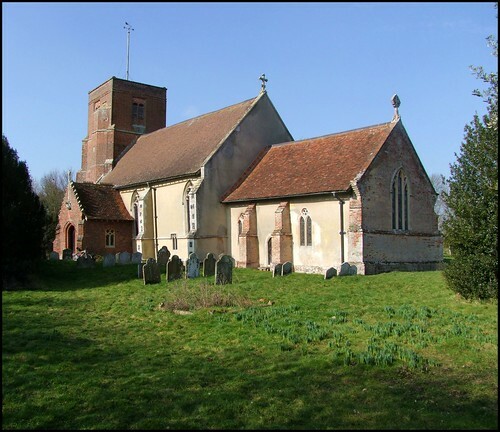 Ashbocking church is not terribly far from its village as the crow flies, but to come here by road involves a considerable journey, a wide orbit around the church enabling you to see it from three sides off over the fields. I was on my bike, and as I turned north the buffeting wind seriously threatened me with a swerve into the oncoming traffic. It was a relief to turn off onto the track which leads to the little hamlet where All Saints sits in its narrow graveyard. This is one of those mellow red brick Tudor towers you often find in the Ipswich area, a reminder of late medieval urban prosperity, although all sense of being near a town is lost here. The church presents its western face to the lane, the grandest perspective of what is otherwise a small and almost entirely late 13th Century structure enhanced and restyled as the fashions of the passing centuries dictated. Ashbocking church received plenty of attention from the Victorians. It was virtually derelict by the early 19th century, and in such a remote spot might all too easily have been abandoned altogether. The interesting and lovely building which survives today is a testament to their commitment. The first sign of this is the south porch, from which a lush Tractarian angel looms, scroll in hand. Suffolk is not a county known for Saxon and Norman survivals, but the font here is probably the earliest in the county, being possibly late Saxon and certainly at least early Norman. It was found under a layer of brick and cement during the Victorian restoration. Another treasure is the rare set of Charles I arms above the door. There are only four left in Suffolk - the others are at Ampton, Denham St John and Mellis. These are the most striking, simply because they are dated 1640, and lettered God Save the King. This is a remarkably late date for such a public statement of support for the Crown. The Vicar of the time was, as several were in Suffolk, drummed out as a Scandalous Minister (that is to say, Liberal Intellectual) and died in prison. There is a ornate tomb alcove in the south wall, with an elaborate canopy. It may have been built for the tomb of John Bocking in the late 14th Century. Set into the back of it is a small 19th Century window. Opposite are a set of late 26th century brass figures of Edmund Bocking and his family, the two wives transposed. Up in the chancel, the east window has some 19th Century replica medieval glass. This is a good building, with evidence of every age in its life, a sense of continuity so often lost elsewhere. This is largely because the Victorians took such good care of it, but also because it must almost always have been a church of the ordinary people. Some interesting curiosa at the west end of the church recall the mood of a century and more ago: a framed notice lists charges for licenses for armorial bearings, male servants, carriages, while beside it a rather moth-eaten tapestry affirms that This is none other than the House of God and this is the Gate of Heaven, obviously the work of some young local girl in the late 19th Century. It's a nice touch, because Ashbocking church is still open to pilgrims and strangers every day. Churches like All Saints are not famous, or worthy of visits from Simon Jenkins, or anything like that. Not so much a museum, there is a sense here that, despite the rupture of the Reformation, this is a place where prayer has been valid, for a thousand years or more.